Heavy rains flooded Houston and parts of southeast Texas today, affecting approximately four million people. Public transportation is shut down; schools have been closed; and Houston Mayor Sylvester Turner asked this morning that all non-essential city employees stay put. 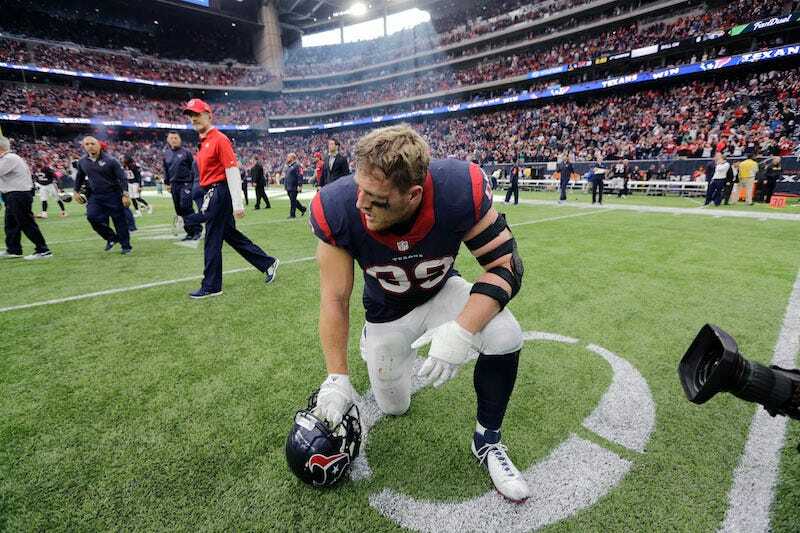 Is Texans defensive end J.J. Watt an essential city employee? No, but he can’t take a day off. It’s hard to tell anything looking at Watt now. He’s sculpted in the upper body the way he’s always been, his arms and shoulders like those of powerlifters. He doesn’t limp or grimace moving around his home, or walking quickly on his property on a brisk, sunny afternoon. No days off! Remember the name! Humbled! Blessed! Prayers up!